The risky purchase project has finished successfully. I admit that this was my biggest gamble evere, I only hoped that it has all the pieces. Although the set has many fragile parts all of them are in excellent shape: nothing is broken or sunburnt, they have not even been covered in dust. From the traces I suspect that the previous owner has built it together once or twice and then all the pieces ended up in a bag, for my luck. 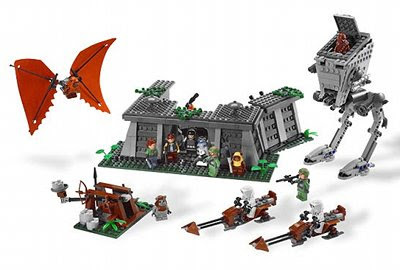 This is the oldest set I have bought so far and the one in the best condition - I will make a comparison of all my purchases sometime. Like its age suggest, the car is built almost entirely from bricks and only a few special parts. 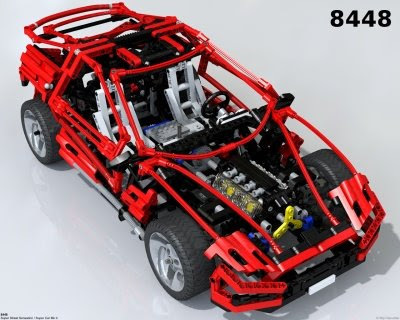 The chassis and the bodywork is made of bricks and so is the rear suspension (excluding the springs and some links). Only the front suspension makes heavy use of special parts. I am very happy that I have bought it, it was well worth the 47 Euros it cost (about $85). Even more so if we count the remaining pieces (I will write about it later). Top Gear star James May plans to build a full scale house made of Lego bricks as part of the now running tv series Toy Stories. The house will have two floors, a shower and everything to live a "normal" life. He plans to spend a weekend in the house - who knows, maybe it will be open for ordinary people after that? One of the helpers takes delivery of three and a half million bricks arriving from the Czech Republic. 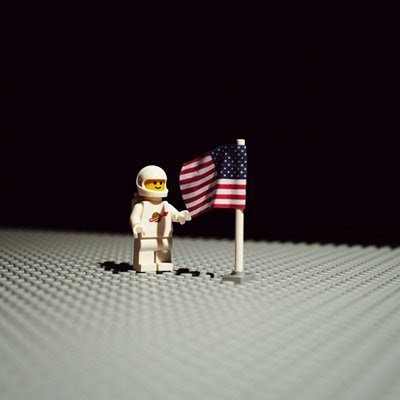 How else could one pay tribute to the successful Apollo-11 mission and the first Moon landing than with this photo? There is more of course. I do not promise to make a video like the one about the 8448, but something is definitely coming. The supercar project reached its first stage of completion - it is complete. The replacement for the missing parts has not arrived yet, so I have built the convertible. 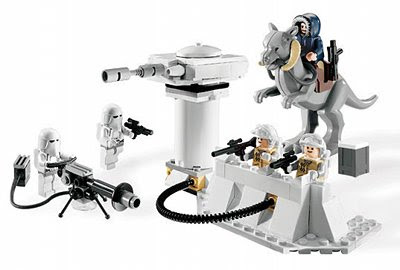 Most Lego models come with instructions to build two or three different models, but this one is different. There is only one chassis only but we get instructions to built 6 different shells: it can be a sports car with gullwing doors, a coupe-convertible, a concept car, a racer, a hot rod or a buggy. This model resembles a real car the most from all the super cars I have seen so far. It has exactly the same mechanical features as a real car: differential, gearbox, engine, suspension and steering. The 8880 is more complex but also makes a less credible impression. The four wheel drive is still ok, but the four wheel steering has not really gained adoption amongst real cars. Unlike the 8880 this car is exactly like a real one: engine in the front, rear wheel drive and a drivetrain between. No overcomplicated chain drives, in exchange easy to push and easy to steer. Another specialty is that each main piece is built separately to be assembled later, like the suspensions and the engine. As usual, images in the album. To be continued! More images in the album. Besides the lot of other new stuff appearing it seems that there will be new Mindstorms NXT 2.0 soon. The brick contains a 32-bit processor, Bluetooth and USB ports. The set includes 3 servos, an ultrasonic sensor, two touch sensors and a brand new color sensor as well. The price is $280 in the US and between EUR 290 and 325 in Europe. TechnicBRICKs provides more details as usual.